ZZ plant stems grow in a graceful, wand-like shape that starts thick and bulbous at the base and then tapers to a point. Along the stem are fleshy, oval-shaped leaves that make the plant look like stylized feathers. The entire plant has a waxy, shiny coating that makes it appear to resemble those made of plastic. 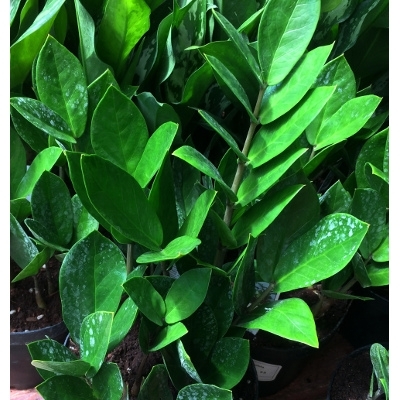 Between the sculptural qualities of the plant and its waxy coating, it is not uncommon for people to insist that it must be an artificial plant.